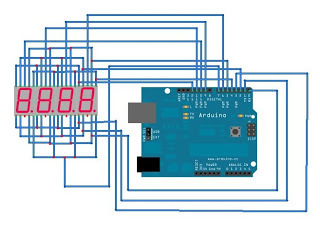 This is an example of how to drive a 7 segment LED display from arduino without the use of current limiting resistors. This technique is very common but requires some knowledge of electronics – you do run the risk of dumping too much current through the segments and burning out parts of the display. This code will work with most Arduinos but you may want to re-route some of the pins.